Dr. Cameron Pickett Weber grew up in Virginia Beach, Virginia, and graduated from Emory University, Atlanta, Georgia, in 1999 with a Bachelor of Science degree in Biology and a minor in German Studies. She then earned her Doctorate of Veterinary Medicine from the Virginia-Maryland Regional College of Veterinary Medicine in 2005. After graduation, Dr. Weber moved to the Northern Virginia area and began working at Pender Veterinary Centre as a general and emergency small animal practitioner. 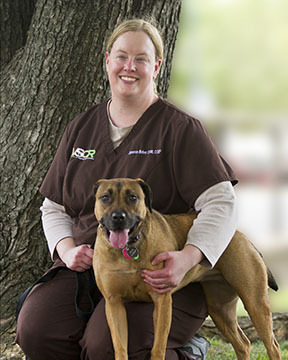 She decided to pursue her interest in rehabilitation medicine and became a Certified Canine Rehabilitation Practitioner through the University of Knoxville, Tennessee, in December 2012. She joined the rehabilitation department at Veterinary Surgical Centers in May 2013. She became a Certified Veterinary Acupuncturist in January 2017. Dr. Weber’s interests include swimming, travel, and reading. She especially enjoys spending time with friends, family, her husband and their spirited dog, Arya.